Gemtrac is a high density, quick access storage system that makes efficient use of your floor space. Each Gemtrac consists of two large cabinets with vertical drawers. The drawers are like pull-out-shelving and they are supported overhead by tracks that connect the two cabinets. 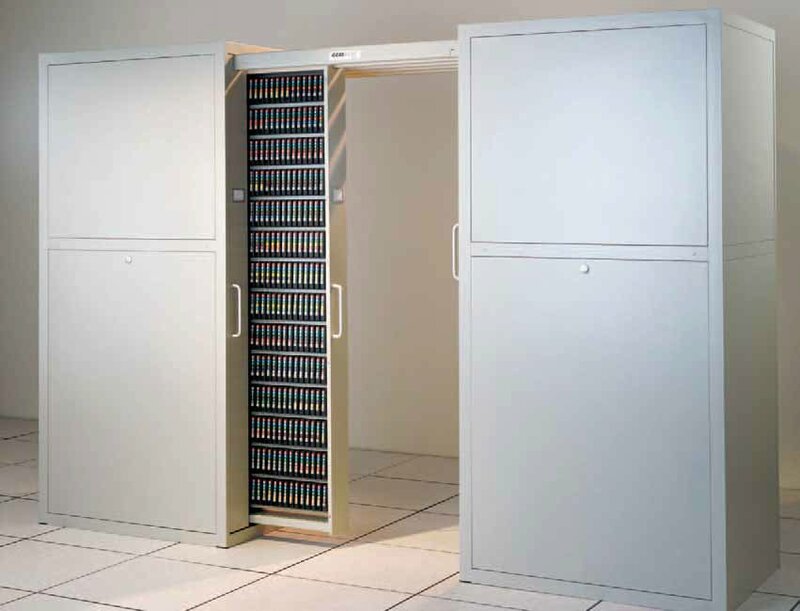 This patented design provides the highest storage per square foot for most small media applications. Gemtracs ship assembled as two separate cabinets, making installation clean and quick. Gemtracs have no floor racks and can even be double stacked for maximum cube efficiency. The unique and most remarkable aspect of Gemtrac’s design is the dramatic reduction in floor space compared to conventional open tape racks. Gemtrac is a high density, quick access storage system that makes the most efficient use of your floor space. Eliminating the wasted aisles required by open rack storage, Gemtrac can help recover up to 70% of the space currently consumed by your tape library. Reduce the space required for your tape library. This space typically costs $300 per square foot to construct! Gemtrac also boosts productivity by condensing your library into a more compact area, reducing travel time between mounts. In fact, the Gemtrac High Density Tape Library puts up to 5,600 data cartridges within arm’s reach. Gemtrac’s unique design incorporates drawers (actually pull-out shelves) instead of open rows of tape racks. Gemtrac drawers are constructed entirely of heavy duty furniture grade steel, with no plastic parts to fatigue or break. Each tape cartridge is safely housed in an individual slot to insure file integrity. The drawers are ergonomically designed to be opened with a natural pulling motion rather than the uncomfortable side-to-side motion typical of open tape racks with sliders. Sturdy all-steel overhead tracks are engineered to safely suspend heavy loads, typical of tape storage, while keeping aisles free of obstructions. Each drawer is suspended by eight precision ball-bearing rollers to provide ultra-smooth and quiet drawer movement time after time. Gemtrac is constructed entirely of heavy duty furniture grade steel, without any plastic parts to fatigue or break. Gemtracs are equipped with high load capacity leveling glides on all corners to insure perfect alignment. Each of the eight glides has a 3" x 3" foot and a 5/8" diameter threaded shaft. For an extra measure of security, Gemtrac is available with an optional gang lock.